Kuwait’s leading food & beverage distributor, partners with Lebanese coffee giant to introduce CAFE NAJJAR’s freshly ground coffee beans, and authentic new coffee technology. 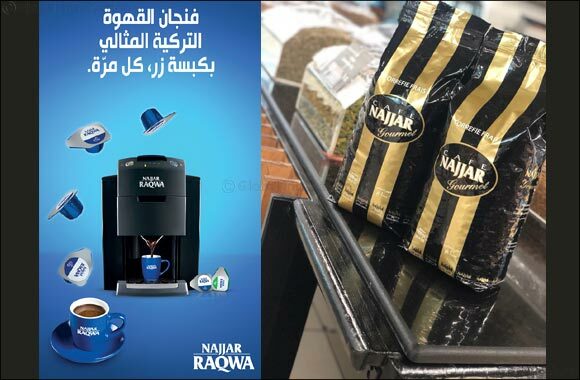 KUWAIT, 31 October 2018: Leading food & beverage distributor Alyasra Foods, has announced its partnership with Lebanon’s largest coffee supplier, Cafe Najjar, as sole distributors of Cafe Najjar’s freshly ground coffee beans and the latest Lebanese coffee technology, Najjar Raqwa coffee machine. The partnership was unveiled at HoReCa KUWAIT 2018, Kuwait’s largest hospitality, catering and food industry exhibition. HoReCa attendees were treated to a cup of authentic Lebanese coffee served in just 45 seconds using the innovative Najjar Raqwa coffee machine. Najjar Raqwa promises to deliver consistent taste at perfect temperatures, using capsules that are available in varied flavors. This solution is currently available to both HoReCa and enterprise businesses. The partnership also includes exclusive distribution of freshly ground Caf� Najjar Turkish coffee. For the growing numbers of discerning coffee drinkers, Alyasra Foods has opened CAFE NAJJAR concessions, offering the best freshly ground Arabica coffee beans, roasted to deliver consistent traditional Turkish coffee. Concessions are located in Carrefour (Salmiya, Fintas, Farwaniya, Jleeb, Sulibikhat, 360 Mall and the Avenues) and Oncost (Sulaibiya, Shuwaikh, Hawally and Fahaheel). “Alyasra Foods is working to bring the best authentic Lebanese coffee experience, to all in Kuwait.” Ayman Mahmoud, COO Alyasra Foods.